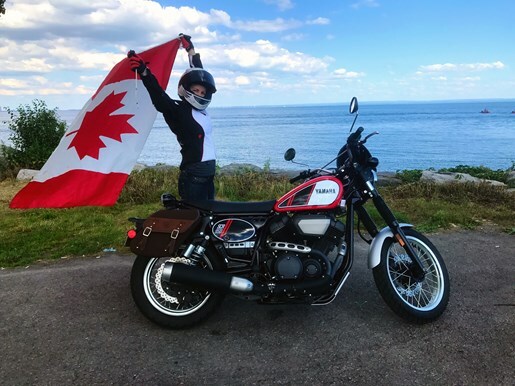 When I parked at the Tim Hortons in Chippawa, a known stop for bikers, and parked among rows of Harley’s and other cruiser style bikes, I had a few people walk by and nod with approval while checking out the bike. 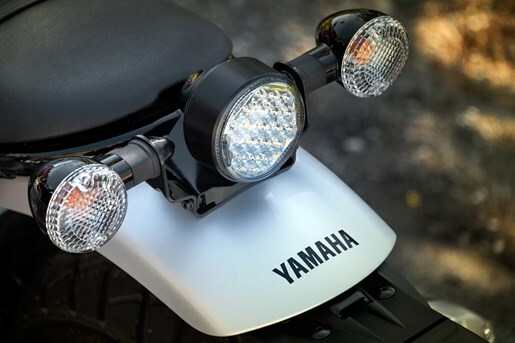 The first thing people seemed to notice was the retro styling of the SCR, which Yamaha seems to have carefully designed with their earlier models in mind. The SCR is like a cross between a 1977 XS 750 café style racer, and a 1976 XT500 Enduro (specific I know, but check these bikes out and let me know if you think differently). The flangeless 13L teardrop tank, combined with retro graphics and matching number plates, wider crossbar handlebars, steel fenders and block pattern tires mounted on aluminum spoke wheels give it a classic scrambler look. Add a retro micro-cowl, upright riding position with centered foot controls, high mounted exhaust, and brown canvas side backs and you’re riding a modern-day time machine that takes you back to the 60’s in an instant. Brand new for 2017, this bike cruised into the new/old retro bike market with a specific crowd in mind. Priced at just over 10K, this bike reaches out to the younger, urban market and blends the barrier between old school biker and new age rider. 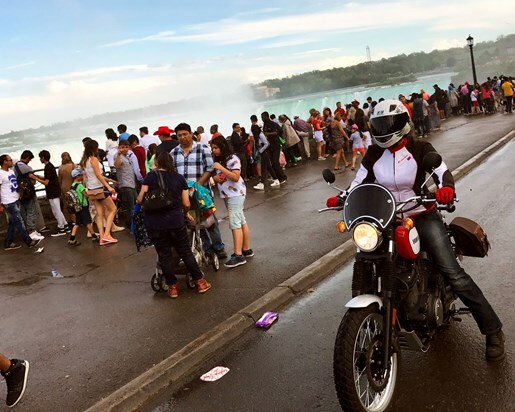 This motorcycle is for the type of rider who enjoys going for shorter rides around town or the city, yet it offers enough customization to completely outfit this bike for longer tours as well. Over the course of a few weeks, I got to know the SCR950 on a pretty personal level. 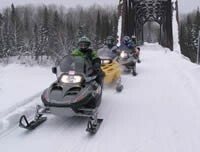 We cruised along Ontario’s south coast, got stuck in a wicked rain storm, celebrated Canada’s 150th birthday, and navigated some of Ontario’s busiest highways. Here is a breakdown of all this bike has to offer plus a few improvements and suggestions I have. In addition to its retro scrambler styling, the engine is one of the primary features of this motorcycle. 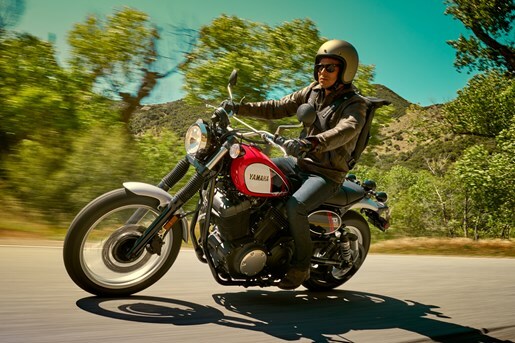 With a 942cc, air-cooled SOHC 4-stroke v-twin engine that is based on the Yamaha Bolt, it has a low rumble that is very appealing to the ears and commands attention from passersby. The 60-degree twin fuel-injected engine has four valves per cylinder which increases air flow to the engine and added performance at all RPM’s (max torque of 3,000). Yamaha boasts about the pent-roof-shaped combustion chamber and 9:1 compression ratio, which essentially means that fuel and air are directed towards the center of the piston for more efficient combustion, solid power and low-end torque. In addition, roller-rocker arms with needle bearings are used to reduce friction and excessive wear on the camshaft compared to regular sliders. The multi-plate, wet clutch system, and wide-ratio five-speed transmission offers quick acceleration and power when needed, especially in the low-mid range. Shifting this bike reminds me of riding an older, vintage bike where the transmission works well but might not be as refined as in some of the other bikes I’ve ridden. Shifting is a bit clunky between first and second gear but isn’t overly noticeable. Another feature includes the stainless steel air cleaner which was designed to add efficient intake capabilities and added torque. While it didn’t bother me too much, several other riders I spoke to who rode this bike were not big fans of the location of the air intake, directly against their knee on the right side of the bike. Hopefully, for future, Yamaha will work on changing the design or location of this. 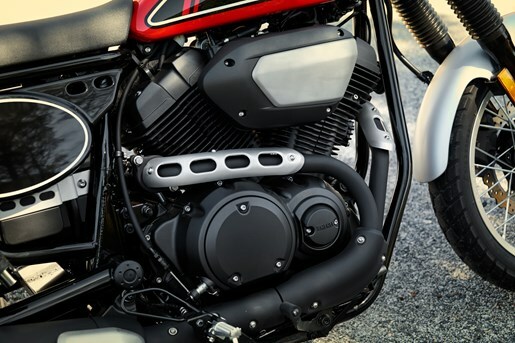 Finally, 2-into-1 exhaust with larger header pipes is designed with a slightly raised muffler to enhance the low-throaty v-twin sound. In a nutshell, it sounds nice, real nice. Some of the recent bikes I’ve tested have been pretty top heavy and tall for me as a rider. 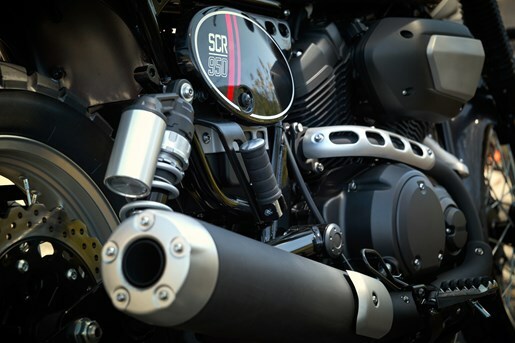 While the SCR is just as heavy, at 547 pounds, the rigid engine mounting system and position offer riders a low center of gravity for easy handling. The tube-style double cradle steel frame is designed to give riders a natural, upright sitting position, and foot pegs located central to the bike also add to an increased ability to maneuver the bike around twisty roads or tighter corners as compared to forward controls. Front 41mm forks (covered in retro style fork boots) offers 4.7” of travel, and the dual shock rear suspension system features five positions of preload spring adjust-ability (max 2.8”) to suit rider preference and increase comfort. 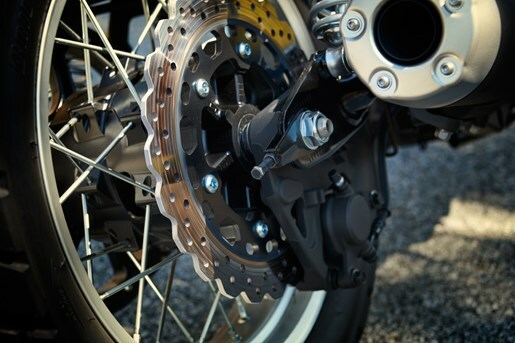 Wave-style disc brakes have been used with the SCR to enhance braking performance and cooling compared to regular round rotors. It’s not the most advanced suspension and braking system out there but again, this is a scrambler style bike, not a couch on wheels. Overall I found the bike to handle quite well in most situations. The limited steering lock inhibits the turning radius slightly, so I found at times when moving the bike around in a stationary position I wasn’t able to do so in smaller areas and had to make a 3-point turn. This bike was a stark contrast to the sport bikes I’m used to riding due to the riding position, low-end torque and less power at higher RPM. 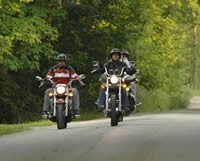 I found I trailed behind my sport bike-riding friends at times and was slower around corners. However, it handled like a champ in a pretty bad rain storm, and rode well on the highway (although I could have used a better windscreen), and was great for cruising along Lake Erie’s waterfront trail. Yamaha designed this bike with elements to boost comfort and ergonomics for its rider. It features a low-profile, slim, one-piece seat for both rider and passenger that sits at 32.7” tall. While the seat and chassis made it easy for my feet to touch the ground, I found the seat to be pretty hard and uncomfortable while riding any longer than a shorter ride. Wider handle bars made for light and easy steering and again the center mounted foot pegs (as compared to forward controls) made this bike incredibly easy to ride over bumps in the road. For someone looking for a fun bike with a solid engine and design, this is a great one to try out. 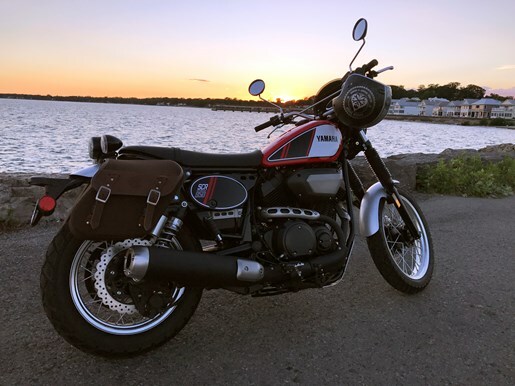 It’s highly customizable with many add-on accessories like a retro style micro cowl, or for more practical wind protection, a quick release windshield. 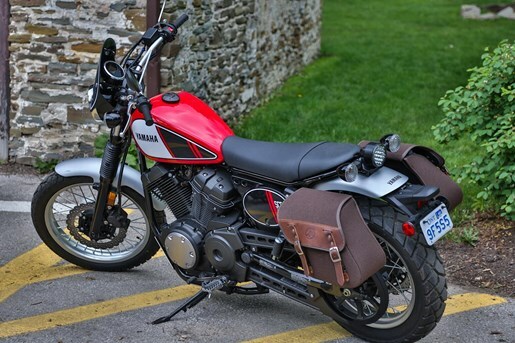 The unit I rode came with brown canvas adventure saddlebags which just added to the retro look. 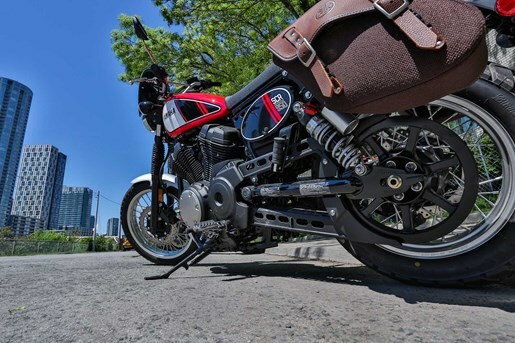 Brass trim pieces, performance shocks and even a skid plate are all add-ons that you might want to consider depending on the look you are after, and function of the bike. I’m not a huge fan of the LED taillights and digital dash which I think take away from the bike a bit; if you’re going to go retro style, go all the way. While this is the first-year model for the SCR, I hope Yamaha will work on improving the comfortability and functionality of the bike. While a cowl windscreen looks cool, it does pretty much nothing to protect against the wind or elements. I would prefer an upgraded seat, windshield and dash (complete with fuel gauge). Sure I love the simpler things in life, but these are some things that I really look for in my ride especially when I’m riding farther distances. Available in red or charcoal. 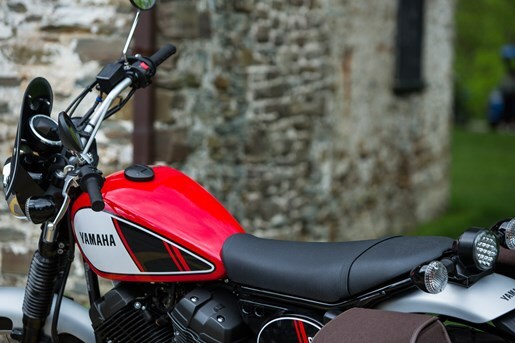 Test a SCR950 out today – click here to learn more about the Yamaha Canada Power Tour.